From the end of WWII until the mid-1980s, there were several ill-fated attempts to fund the building of the Balboa Reservoir; it was dug and paved but not finished in the late 1950s. Its real life during these years was as an asset to City College, first as West Campus, then as parking for students, faculty, and staff. But it also functioned as a place for a host of casual uses by local residents, some legal and some not: teen drivers, go-cart races, runners and walkers, Riordan football team training, underage drinking, motorcycle berm-jumping, police safety training, and more. No city agency seriously considered housing during these years; after WWII there were still plenty of empty lots in the city on which to build. In June 1944 the SPFUC discussed the matter of leasing the reservoir land to the US Government, in line with the US President’s edict that any unused public land be put to wartime use. The Navy was given a lease which was to end six months after the “national emergency.” A large compound comprising many buildings was quickly built for the United States Naval Reserve Women’s Reserve, known under the acronym WAVES (Women Accepted for Volunteer Emergency Service). The facility opened in July 1945. It included housing for over a thousand enlisted and officer women, two-story buildings, and an auditorium, with all the needed water, sewer, electricity, and gas infrastructure. It was an impressive effort. 1947c. Aerial looking over the Navy’s Women’s Reserve facility on the Balboa Reservoir land. SAN FRANCISCO HISTORY CENTER, SAN FRANCISCO PUBLIC LIBRARY. 2017 Google satellite photo of Balboa Reservoir, with an overlay of West Campus from 1947c black and white photo. View larger. View photo without overlay here. The lease was for 29 acres at about $100 a month ($1200 now), and left out some land along Ocean Avenue and a portion on the north that was about to be purchased by the Roman Catholic Archbishop of SF for a boys’ high school. (More on this below). The photo above shows that the compound extended from close to Ocean Ave, with an entrance at Lee Avenue, over most of the reservoir property, north to a line level with the north exit of Cloud Circle onto Phelan Ave, well clear of the land where Riordan High School would be built in 1950. 1945. Entrance to Navy WAVE barracks compound, from Ocean Avenue at Lee Avenue. Photo from USS Balboa booklet. Mount Davidson in background. Thousands of women serving in the Navy passed through the barracks at “USS Balboa,” as it was called. There were living quarters, recreation and entertainment facilities, a mess hall, stores, a sickbay, a laundry, even a beauty salon—as well as offices for administration, records, communications, and maintenance. At the end of its short life, some of the women there created a delightful booklet that documented what happened and the names of women who passed through. Here are some photographs from it. Download the whole booklet here (PDF). 1945. Group of WAVES in front of the auditorium. From “USS Balboa” booklet. 1945. Lt. Commander Irene Williamson, in charge of USS Balboa, WAVES facility. From “USS Balboa” booklet. 1945. Inside buildings at the facility. From “USS Balboa” booklet. 1945. Scenes from “USS Balboa” booklet. 1945. Left, inside auditorium; right, at mess hall. From “USS Balboa” booklet. Included there was a “Separation Unit” that helped women transition to civilian life, providing informative movies, interviews and lectures, with counseling for family, financial, legal, or personal issues. The facility was decommissioned in September 1946. 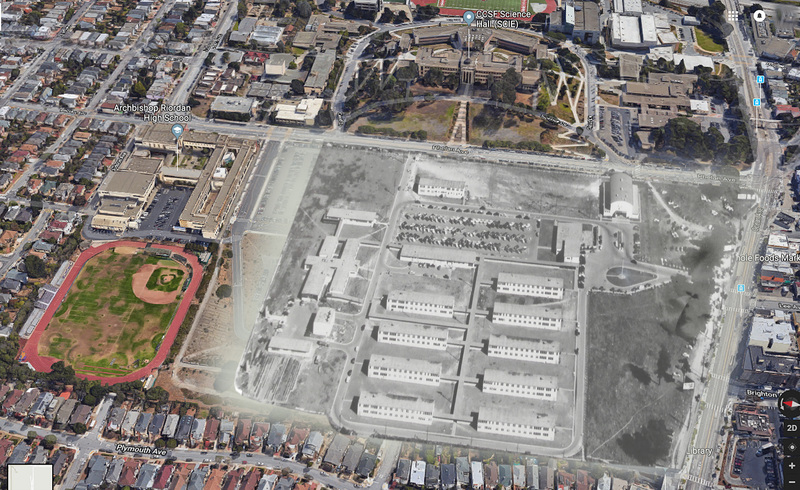 When the Navy left, the SFPUC leased the lot along with all the numerous buildings and infrastructure to City College of San Francisco (then SF Junior College). This event was marked by a ceremony, turning over the site to the college. An account of the change at West Campus. The Guardsman, 27 Sep 1947, p4. View larger. A description from a later history of City College: “[S]even of its fifteen buildings were converted to classrooms, three became dormitories for veterans, one was utilized as housing for fifty married veterans, and four were remodeled into offices. In addition, the 1000-seat auditorium and spacious cafeteria on the site were immediately put to use.” Also housed there was one of the college libraries. 1947. View of West Campus with Phelan Ave in foreground, looking west. SAN FRANCISCO HISTORY CENTER, SAN FRANCISCO PUBLIC LIBRARY. 1951. From Ocean Avenue, at the Lee Avenue entrance to West Campus. Auditorium visible behind trees. SAN FRANCISCO HISTORY CENTER, SAN FRANCISCO PUBLIC LIBRARY. It was a boon for the fledging public educational institution. The Ocean Campus for CCSF had been established before the War on the park land between Phelan Ave and the old railroad tracks. Now the school had to contend with a huge uptick in students flocking to it, including returning GIs. The new facilities were called West Campus and became the center of student activity, remaining so for nearly a decade. 1954. City College students in a West Campus walkway. Plenty of parking for those mammoth autos. SAN FRANCISCO HISTORY CENTER, SAN FRANCISCO PUBLIC LIBRARY. There was a student activity center with a soda fountain and a jukebox for dances. Another building housed darkroom facilities for the photography students. Later there was a ceramics studio. The capacious auditorium hosted frequent concerts, variety shows, and plays. Diagram of West Campus in the Guardsman, 1 Oct 1947. View larger. Meanwhile the Roman Catholic Archbishop of San Francisco bought the most northerly 400 feet of the Balboa Reservoir lot. In 1933 the church had already bought the most northerly 300 feet, then in 1947 a 100-foot adjacent strip was added to the lot, making the first ‘cut’ in the original 42-acre property. It is an area about 400 by 1022 feet, equivalent to about three residential blocks. DPW maps 197_dm and 206_dm put together. Balboa Reservoir outline in fuchsia. Two phases of RCA property acquisition for Riordan High School: purple 1933, aqua 1947. Also shown, lot on Ocean Ave acquired by Safeway in 1954, green (more below). The total price for the 9 ½ acre piece was $50,000 ($693K now), about $5300 an acre. The Archbishop Riordan High School for boys was built on the site in 1949-50. This lot (3180/002) comprises about 22% of the original Balboa Reservoir property. It was the largest piece that the SFPUC had sold off, until a portion was granted to City College in the 1990s in a land swap with the City. This suggests the sale was forced on the SFPUC by some other agency or individual in City government. I found no public discussion whatever of this sale of public land. 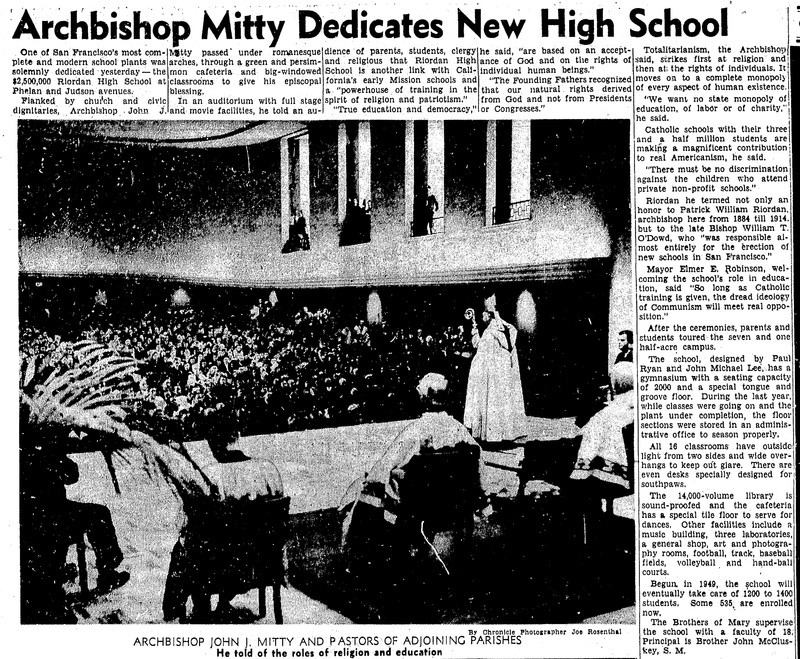 Perhaps a testament to the sway of the Catholic Church in midcentury San Francisco. Construction of the high school dead-ended forever three residential streets—Hazelwood, Colon, and Wildwood—which the original developers of Westwood Park likely foresaw as eventually being connected to future adjacent neighborhoods. The school was dedicated in September 1950. The athletic field on the west side of the school lot was finished sometime soon after this. SF Chronicle, 18 Sep 1950. Dedication of Archbishop Riordan High School for boys. View larger. The SFPUC was more upfront about their aim to sell the southerly 150-foot-deep strip along Ocean Avenue for commercial purposes, first discussing it in September 1947, revisiting the matter during 1952, and then rescinding the request until the needed rezoning could be arranged. By about 1953 the SFPUC was set to sell. There were other changes along the Ocean Ave side. By May 1952, the Phelan Loop had been put in place as a terminus for Muni lines. SF Fire Department’s Station 15, on the corner of Ocean and Phelan Avenues, opened in September 1957. The next piece to be cut and sold was Lot 3, to Safeway Stores Inc in June 1954. This was located on the southwest corner of the reservoir lot, fronting Ocean Avenue. (See property map above marked with color tints.) For this, the SFPUC got a much higher price: the 1.84 acres sold for $160,000 ($1.5M now). This price per acre is about 16 times what the Church paid for its cut—although clearly the value of commercial land along Ocean is appreciably higher than the Riordan High School lot. Safeway opened their store here in 1957, and closed it in 1977, when it became a Grand Auto Supply, later Kragen Auto Parts. It was a medium-size store, smaller than the Safeway on Monterey Blvd, surrounded by a parking lot. A bit of it can be seen in this photo of the Phelan Loop from 1968. Here is an aerial shot from later, which shows the Safeway building (by then Kragen). 2003 satellite image. Ocean Ave with Kragen on left, with Phelan Loop in middle, and Station 15 on corner. Google Earth. So by the mid-1950s the original 42-acre reservoir site had lost almost 10 acres on the north and effectually three or four along Ocean Ave. Through the late 1940s and early 1950s, while CCSF was getting good use out of the middle 29 acres, the SF Public Utilities Commission continued to plan for the eventual construction of the reservoir, citing the growing water consumption in the city. 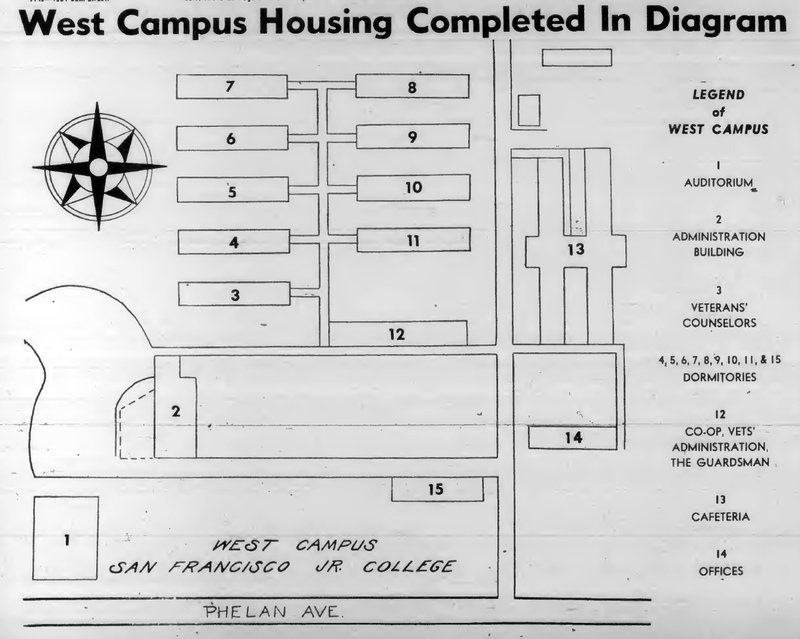 In 1955, the SFPUC finally put an end to West Campus. It set the date for the end of the CCSF lease to 31 Dec 1955, as part of plans to begin construction of a 75-million-gallon, two-basin reservoir on the land in 1956. Part of the rationale was based in Cold War thinking: SF needed a supply of water protected from nuclear fallout. The seventeen buildings, covered walkways, and auditorium were demolished about May 1956, after almost a decade of use by the college. A bit of CCSF history. The Guardsman, 27 Apr 1955. 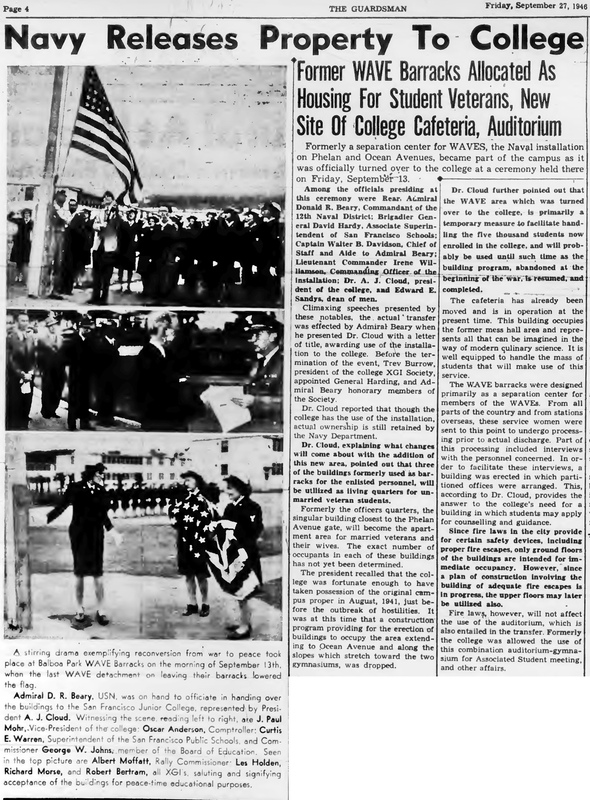 The date of 1943 for the opening of the Navy facility is in error. College enrollment generally had dropped after the post-War boon. But the dip was temporary, and in particular, public higher education enrollment would steadily increase in the 1960s and 1970s. One has to question the wisdom of eviscerating such useful educational infrastructure and property. Later, CCSF’s dearth of land was one of its besetting shortcomings, historically having a lower land-to-student ratio than any other community college in the state. However, SFPUC wanted their reservoir. Unfortunately it was building for a boom that was already over; San Francisco population would steadily fall for the coming decades. When the uptick came in the 1980s, it would be housing, not water infrastructure, that was in short supply. Although the CCSF administrative offices moved out to main campus buildings before the deadline got close, there were activities and events on West Campus up until the very end of the college’s lease. At the end of the 1954-55 academic year the college’s 20th Annual Festival was held there, an event the president of the school pronounced “the most successful of such events ever held at the college.” Enterprising photography and drama students were shooting a film in west campus right up to the end of that year. Shooting a student film in the soon-to-be-demolished West Campus. The Guardsman, 25 May 1955, p2. First task for the SFPUC was excavation and embankment. In August 1956, Polombo Construction Co was awarded the contract, for $363K ($3.3m now). The job was finished by July 1957. The SFPUC minutes noted the “many complaints” of nearby residents who objected repeatedly to the use of blasting explosives for excavation. The SFPUC went to the trouble of planting 80,000 square feet of ice plant, “to alleviate the dust and sand nuisance to nearby residents.” (Ice plant, a nonnative plant, can still be seen on the reservoir.) Much of the rock used to create the embankments (berms) was gotten from the Sunset Reservoir. 1957. Looking east. Pipes being installed in the middle berm. SAN FRANCISCO HISTORY CENTER, SAN FRANCISCO PUBLIC LIBRARY. In October 1957, the SFPUC awarded a contract to Fay Construction Co for the asphalt lining, grading, and drains, the next steps in the reservoir construction. The cost was $245K ($2.2m now). That was finished by November 1958. 1959. Looking south over the Balboa Reservoir shortly after excavation and paving finished. Note painted lines for parking in North Basin already in place. SAN FRANCISCO HISTORY CENTER, SAN FRANCISCO PUBLIC LIBRARY. And that was the end of any actual work on the Balboa Reservoir, as reservoir, forever. 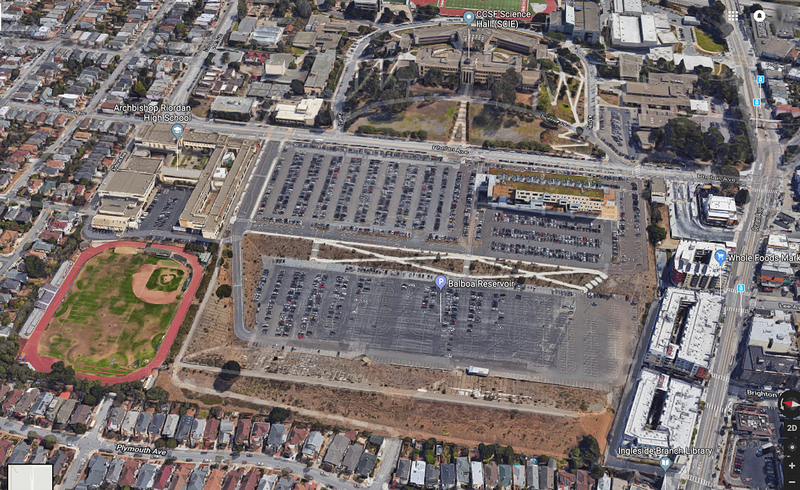 Immediately, half of this vast swath of expensively asphalted land became just what it looked like and was fated to be for the next 60 years: a parking lot for City College students, staff, and faculty. 1963. Looking east over North Basin parking lot. Science Hall at top. SAN FRANCISCO HISTORY CENTER, SAN FRANCISCO PUBLIC LIBRARY. The SFPUC leased the North Basin to CCSF for parking, and later promised that when the reservoir was finished, the school would have the right to a parking lot on the roof. Later, in the 1990s, South Basin was also leased for CCSF parking (see next post). Parking capacity helped the college grow in enrollment, catering as it is did, and still does, to people who have other responsibilities like families and jobs. That said, the parking capacity of the reservoir property has never accommodated anything more than a small fraction of the total student enrollment; most students take public transit, even before Bart, and have done since the college began. Here’s a map from 1940 showing the crosstown bus no.1 going to SF Junior College. 1940 SF transit map, showing crosstown no.1 bus going to SF junior College. From Eric Fischer’s collection. 1959. Aerial looking west over City College and newly paved Balboa Reservoir. Riordan High school on right. New Safeway on left. SAN FRANCISCO HISTORY CENTER, SAN FRANCISCO PUBLIC LIBRARY. This photo was taken looking west. It might be said to illustrate the feelings of many in the City College faculty and administration who in later years came to see their school’s destiny as laying before them, across the road on reservoir land. What better place to expand, especially after construction of the I-280 freeway in the 1960s made the eastern side of the campus inhospitable, inaccessible, and unaesthetic. Open as it was on weekends when there were no classes, the now-paved basins were put to the various casual uses of the sort that go unmeasured and generally escape the historical record: teen drivers and other learners, motorcyclists, go-cart racers, runners, dog-walkers, bicyclists, school-cutters, underage-drinkers, open-space thinkers, etc. Those things that did make it into the news were few and far between: The VW Club of California held their “The Wheel Deal Gymkhana” event at the reservoir in 1960 and 1961, sanctioned by the Northern California Sports Car Council. A gymkhana is a short manmade obstacle course that is timed, where a sports car driver demonstrates maneuvering skills. Rmmm rmmm. It probably wasn’t this exciting. Taken at Nassau Speedway, 1960s. The SF Chamber of Commerce held an auto safety checkup event at the reservoir in 1963. In 1974, the March of Dimes held their walkathon. In this photo, the SF Police Dept is holding an auto safety demonstration class with what looks like a big class of bobby-socked teens. How long does it take for a car travelling 30 miles-an-hour to skid to a stop? The uniformed men are measuring the pavement to make their point, while the teacher looms over the kids keeping them in line. One women who grew up in Sunnyside in the 1960s recalls roller-skating in the reservoir as a child; “It was especially fun when it rained and it would have a few feet of water. We would go through it and get all wet! … And, of course, learning to drive.” Another local says he had a great time running his motorcycle up and over the middle berm. After jogging became a popular pastime, it was common to see runners circling around the perimeter berms. One local mom recalls, “St Finn Barr parents used to meet and walk around the berm on weekends for exercise and to socialize a bit.” Another resident remembers: “Walking, running, bicycle riding, dog walkers, and Tai Chi, were all common early morning activities on the old berm.” One local man began walking around the reservoir to deal with chronic back pain, and when that was too boring, he began running, which ended up changing his body and his life in a good way. After the paving in 1958, the SFPUC continued its efforts to complete the half-finished job. Water bonds were passed by voters in 1961 and 1972, and for years after each of these funding measures, the SFPUC put money aside to finish the reservoir, and yet never managed to do the job. The final push was in January 1977, when the SFPUC declared “In 1977-78 work will commence on the Balboa Reservoir and pump station, which has a $6 million combined cost. Failure to do these jobs will result in an increased escalation of prices.” By July of the following year, the Chronicle announced the effective end of any plans to finish the reservoir. SF Chronicle, 26 Jul 1978, p4. Apparently the high rate of inflation in the 1970s, coupled with the SFPUC’s mistake in not doing a proper initial environmental impact study, had by the end of the decade pushed the cost up to an exorbitant price. In those years when the north basin was used for parking and the SFPUC was holding onto its reservoir construction money, the south basin sat empty, with no official use. No wonder that SFMTA started eyeing it for a bus yard about 1968, when the disruptions to Muni operations caused by the construction of the Balboa Park Bart Station were first being felt. By 1976 there was a full-fledged plan to house hundreds of diesel buses on the south basin land. There came such swift neighborhood resistance to the idea, demonstrated at a public meeting in May, that the SFMTA immediately backed down. Noise, pollution, and a reduction in property values were the focus of objections. SF Chronicle, 22 May 1978, p9. Later that month, the editor of the Sunnyside News, Ken Hoegger, reported that in addition to 265 buses, Muni planned to build offices there for 365 employees on the site. In this newsletter of the Sunnyside Neighborhood Association (SNA), we also learn that this effort to resist Muni’s bus yard was spearheaded by Jesse David Wall, CCSF physics teacher and SNA past-president, by putting together a coalition of neighborhood associations from Westwood Park, Miraloma Park, Mission Terrace, Oceanview-Merced-Ingleside (OMI), and others. As we’ll see in the next post, Wall’s leadership was critical in the defeat of proposed housing for the reservoir site in the mid-to-late 1980s. This was just the first fight over the uses of the ever-dry reservoir. In the next post I’ll cover the tug-of-war over housing at the site. My sincerest thanks to Harry Bernstein for generously sharing his research on the Balboa Reservoir for this article. Many thanks to those who contributed to this series of articles: David Gallagher; Andre Guillory, Office of the Assessor-Recorder; Ken Hollenbeck; Oanh Mai, CCSF Archivist; Natalie Mattei, Albertsons Companies; Andrew Sherman; Jesse David Wall; and the local residents and neighbors who kindly responded to my queries about their unofficial uses of the reservoir space over the decades.